Brian Vickers drove the #11 FedEx Delivery Manager Toyota to a 35th place finish in the Toyota Owners 400 on the short track of Richmond International Speedway. With three laps remaining in the race, a brake failure sent the #11 FedEx machine into the wall and ended the team’s day. Kevin Harvick claimed the checkered flag in the caution-filled race on the 3/4-mile oval at Richmond. Clint Boywer, Joey Logano, Juan Pablo Montoya and Jeff Burton rounded out the top five finishers. Vicker’s Joe Gibbs Racing teammates Matt Kenseth and Kyle Busch finished seventh and 24th, respectively. 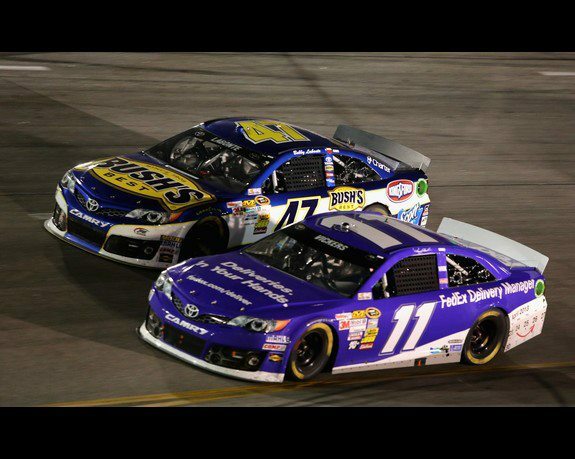 The #11 car featured a special paint scheme to celebrate the launch of FedEx Delivery Manager that allows customers to choose how, when and where they want their packages delivered. The race also marked the third consecutive NASCAR Sprint Cup Series race for Vickers filling in for the recovering Denny Hamlin. Starting the day on the outside of row one, next to teammate Matt Kenseth, the early part of the race went well for the FedEx team. Despite a slightly loose race car, Vickers piloted the #11 car at the front of the pack, maintaining his early starting position. Adjustments to the handling on caution flags one and two were unable to correct the issues. On the third caution flag of the day on lap 146 of 400, Vickers requested to return to pre-race configurations. Despite the handling tweaks, Vickers continued to fight the car to maintain his top-ten position. Crew Chief Darian Grubb brought the car in after the fourth caution flag on lap 157. Grubb made the strategic decision to give up some track position to make additional adjustments to the chassis. The car proved more difficult to correct than expected and the team continued to slide, falling as low as 25th before the next pit opportunity under caution on lap 233. The second track bar adjustment of the day was paired with four fresh tires and fuel in hopes of resurrecting the team’s early race success. But shortly after brake issues began to give Vickers additional difficulties in piloting the car. More bad luck followed on lap 311 when Vickers bumped into the back of the #22 as it abruptly braked entering pit lane. The resulting damaged required two pit stops to repair, leaving the #11 team in 27th place with 75 laps remaining. Vickers was again pulled into an unavoidable accident when the #5 car spun on lap 337. The #11 car sustained front and rear damage and was forced to pit lane for repairs. Vickers had driven up to 14th place before being tangled in the wreck. With under ten laps remaining, Vickers sensed the brakes may not make it to the end. His premonition proved to be correct when a brake failure sent him into the wall on lap 397 and out of the race.